Bring the rubric to LIFE! If you haven’t seen it yet – here it is! One of the best things I have learned about giving feedback is that students need to know 1 thing they can work on to improve their language skills. I try to compliment something the student did well and make one suggestion that will help the student move toward that next proficiency sub level. I know the rubric well after working with it so many times, but how can I remind students how to improve during a unit without waiting for the end-of-unit assessment results? 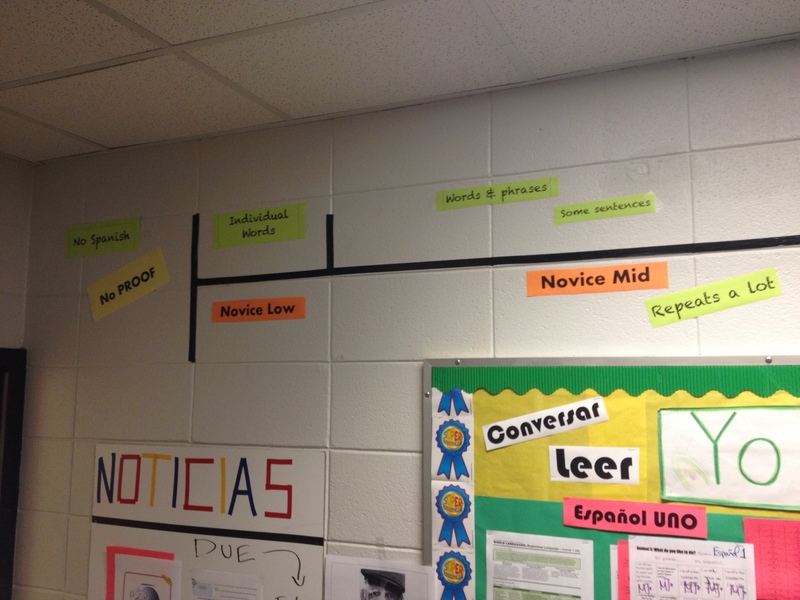 I decided to bring this rubric to life in my classroom. 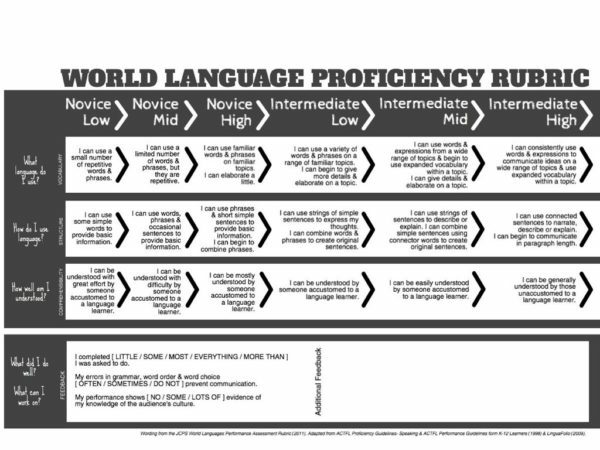 Here is my learner-sized version of the proficiency rubric and some of the key characteristics of each level. Here is a free download of the similar to the ones in the photos that can be used in any language class. They are very simple so you can add your own style and edit. How do your students know how they are doing? Do they know how to get to the next level? Megan, this is awesome! Did you use electrical tape for the wall? In that same vein, Megan, what did you use to tape the words to the wall? I have a really hard time finding something that will stick to the concrete block that makes up the walls in JCPS classrooms. I use hot glue & it sticks great to concrete walls! Does this come off easily? Or is it stuck there for good? I’ve never used hot glue but electrical tape sticks great and goes up and come down no problem! I always use a hot glue gun. Works wonderfully! Another Megan who thinks this is fantastic! I am going to put one up this weekend!!! That’s so great Megan! Just sent the link to my colleagues and I want us to get together to spend an afternoon getting the timelines on our walls. It will be such an easy reference! Send us a pic of your versions! I’d love to see it! This is AWESOME!! Do you have the examples you have on the wall in a word document that you’d be willing to share? I’d like to use the rubric, but I’d like to know how to use it properly! 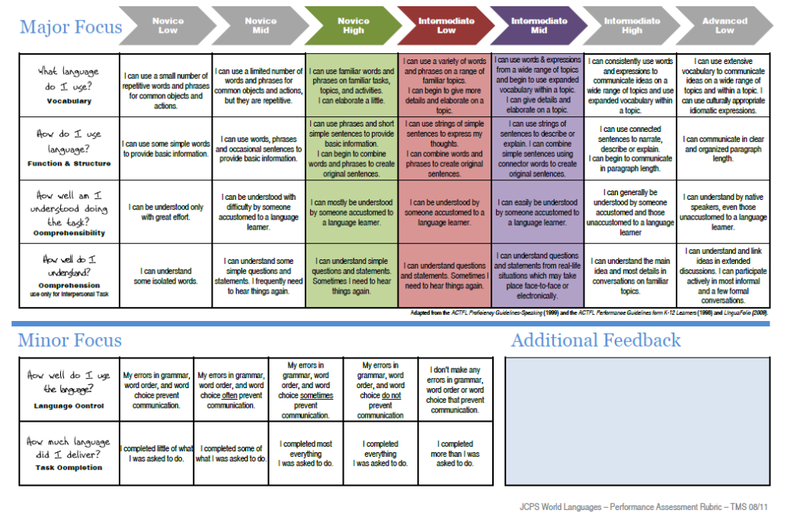 Do you have a downloadable/printable version of this fabulous rubric? This link should get you there. You can download it or print it from Thomas Sauer’s page. Feel free to share it! Thank you so much for sharing! I am passing along to everyone in the district. Merci! Thanks much – I put it up tonight already! So excited to share it with the students! When you have ideas about how to further fill out the Intermediate sections, would you be willing to share those excerpts too? I’m working on mine now! Were you able to come up with any ideas to fill out the Intermediate sections? WOW, what a great idea, Megan! Such a great way to remind students of what they’re shooting for! I think my ELLs could benefit from something like this too! 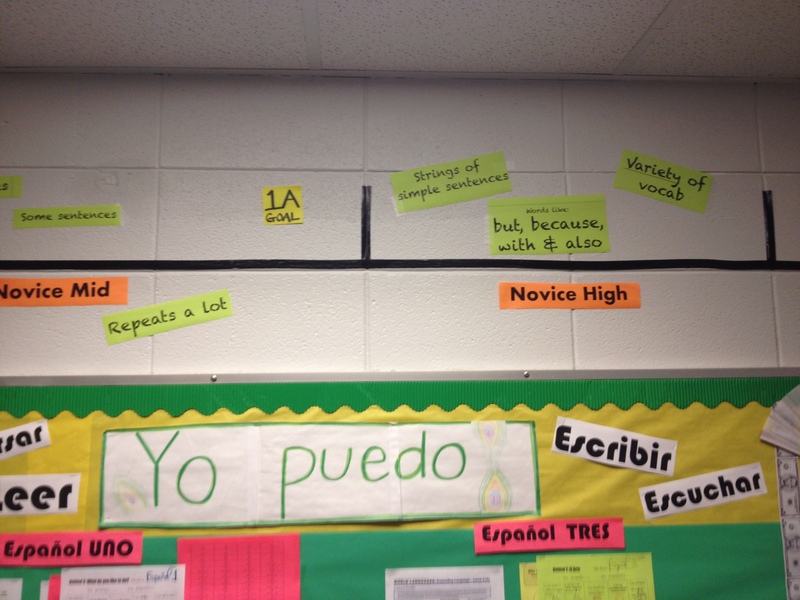 Megan…I love the rubric and how you have displayed it in your classroom! I’m wondering what this looks like for individual assessments? Do you use a 4, 3, 2, 1 scale when assessing/reporting for the grade book? Thanks!! I started using this Rubric in November of last year and when I showed it to my students (middle school) they really got it. I never thought of putting it on the wall so they could be reminded of it. Thanks for the great visual! Megan I love this idea! Thank you for sharing! I am currently making the words to print off and stick up on the wall. I also love the way you have the “yo puedo” board. It looks like you have a specific area on the board for each class that includes the current unit outline and the stamp page? Could you share a few more photos of that board? Or share the specific items you include on the board? It was great to find this post tonight, as I have been staring at my wall thinking I needed something visual to explain the levels. We’ve been working on porque and con to expand oral and written sentences. Thank you for the useful idea. 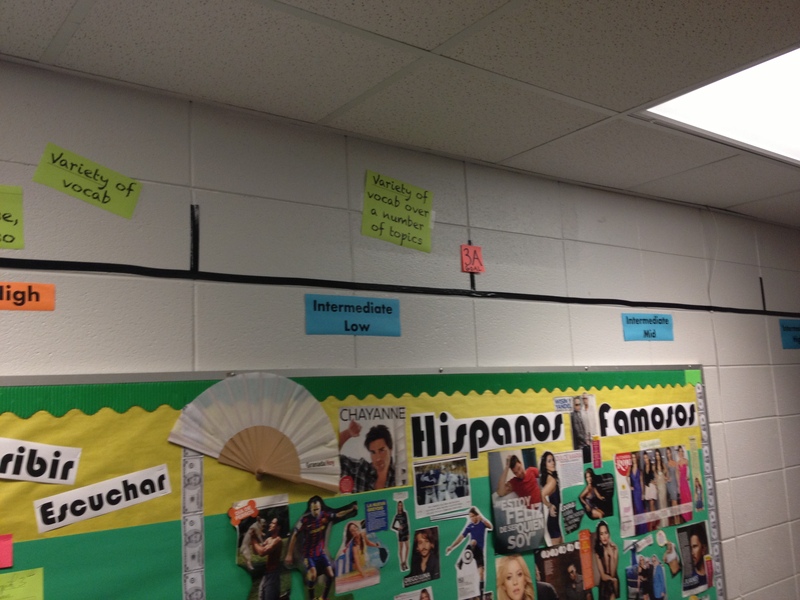 Inspired by your post, I created a proficiency timeline in my classroom this year. I teach a class of French 3/4 together, and having the proficiency information posted is so useful. In the first week of class, one of my French 3 students came after class and asked me what his level of proficiency was and how he could get to the next level. He asked if he was bothering me, and I reminded him that my job was to help him learn! Thanks so much for being a constant source of inspiration! I’m so putting a rubric on my classroom wall next year. Hi Megan! I love this idea and will definitely put something up like this in my classroom! I was wondering what the board below with ¨Yo Puedo¨ on it was for? Is this sort of like a checklist for students? Thanks for sharing! I already enlarged the Can-Do Statements but I like this idea as well!